Robert Alter wrote in Partial Magic that the danger of metafiction is that it may produce overly intellectual formal exercises that lack the emotional power and philosophical complexity of art. “One of the great temptations, however, of the self-conscious novelist is to content himself with technical experiment, trusting that in these difficult times (but then the times are always difficult) the only honesty, perhaps the only real profundity, lies in technical experiment. This is the chief limiting factor in most of Robbe-Grillet as well as in Coover’s collection of fictions, Pricksongs and Descants. In both, one can admire the virtuosity with which narrative materials are ingeniously shuffled and reshuffled yet feel a certain aridness; for the partial magic of the novelist’s art, however self-conscious, is considerably more than a set of card tricks” (Alter 222). In the meta-class, we read a long list of short modern fiction: John Barth’s “Lost in the Funhouse,” William Gass’s “In the Heart of the Heart of the Country” (Gass was the one who coined the term “metafiction”), Robert Coover’s “Seven Exemplary Fictions,” and David Foster Wallace’s “Octet.” By the time we got to “Octet,” I got bored. In fact, I got tired of metaficion. Why had I given myself this enormous project to investigate and understand metafiction? I missed naturalism. I missed having believable characters I could emotionally connect with. I reminded myself that the longer, more emotionally satisfying metafictional novels had characters you could love, as in Don Quixote, Tristram Shandy, and Pale Fire. I don’t mind being told that Don Quixote, Uncle Toby and Dr. Kinbote are fictional creations, as long as they get up from the page anyway and walk around me. I don’t mind having the magic trick explained, as long as the illusion is still impressive. Even though the narrators of these novels remind us that we are reading an artificially constructed novel, the partial magic works and the characters come alive. Of our readings this time, Barth’s story had the most emotional power, Gass’s some, Coover’s a bit, and Wallace’s, at least in the second half, almost none. Actually, Wallace’s story began well. It starts with the fourth question of a pop quiz (what happened to 1, 2, and 3? ), describing “two late state terminal drug addicts,” one of whom had a coat and the other who was gravely ill. In the early morning of 12 January 1993, “The terminal drug addict with the coat took off the coat and scooted over up close to the gravely ill terminal drug addict and took and spread the coat as far as it would go over the both of them and then scooted over some more and got himself pressed right up against him and put his arm around him and let him be sick on his arm, and they stayed like that up against the wall together all through the night” (Wallace 111). That’s good stuff, lots of emotional impact. After a black space, we read, “Q: Which one lived.” Interesting question. (Or is it a question? Notice there is no question mark, just a period. How could it be read as a statement.) Just by asking the question, the narrator (Wallace?) tells us that one of the drug addicts died during the night. Naturally, one would assume it was the one who was gravely ill, but — something I realized in school — if someone asks a question that seems too easy, the less obvious answer is probably right. In fiction, it would be too obvious if the terminal drug addict died. In contrast, it would be tragic if the one who shared his coat passed away, sacrificing himself for his junk sick buddy. I chose the healthier of the two. Very interesting. I was excited about the next question. Yet the next section, “Pop Quiz 6,” is quite long, but never reaches a question. The narrator tells us at the end, “In fact the whole mise en scene here seems too shot through with ambiguity to make a very good Pop Quiz, it turns out” (113). What is a pop quiz anyway? A pop quiz is when your teacher surprises you with a quiz to check to see if you have done the homework. Is Wallace setting himself up as our teacher? If so, it puts us in the uncomfortable position of having to prove ourselves. Pop also refers to pop culture, and metafiction had become almost pop by the 90’s, when Foster wrote “Octet” since it was so common by then. The next question, question 7 (where are 1, 2, 3, 5, and 6? ), is another emotionally charged dilemma, then he takes another stab at 6, this time “6(a).” The characters are called “X” and “Y.” The question at the end, we are told, is “Self-Evident.” The reader is being asked to participate, to help write the fiction. Very interesting, as I said. Pop Quiz 9 begins promisingly: “You are, unfortunately, a fiction writer.” Does he mean me? You? The second person causes us to imagine ourselves as writers and imagine ourselves in the dilemmas Wallace faces as he writes “Octet.” “You are attempting a cycle of very short, belletristic pieces, pieces which as it happens are not contes philosophiques and not vignettes or scenarios or allegories or fables, exactly, though neither are they really qaulifiable as ‘short stories’ (not even as those upscale microbrewed Flash Fictions that have become so popular in recent years — even though these belleteristic pieces are really short, they just don’t work like Flash Fictions are supposed to)” (Wallace 115). Okay, so far, so good. He explains why some numbers are missing in the octet. “So you do an eight-part cycle of these little mortise-and-tenon pieces. And it ends up a total fiasco. Five of the eight pieces don’t work at all — meaning they don’t interrogate or palpate what you want them to, plus are too contrived or too cartoonish or annoying or all three — and you have to toss them out” (Wallace 116). Palpate? What a disgusting word. Palpate means, “To examine or explore by touching (an organ or area of the body), usually as a diagnostic aid.” Kt argued in favor of the word, as being the right word. It made me uncomfortable, but who does not get uncomfortable when their cervices or prostates are palpated. Wallace’s story certainly affected me, as a prostrate exam might. But what was he trying to massage? I felt I had a better idea when he was sticking with the pop quizzes. For the last half of “Octet,” instead of the pop quizzes, we get fourteen more pages of fictional self-analysis, without any characters (except the narrator), without any action (except the asking of questions), and that is where it gets ugly. Except, I now have a problem and I have to scrap what I have written so far. Even when I began writing this post (way back in August), I began to doubt myself. Underneath the photograph of Centre George Pompidou, I wrote, “It is ugly,” but when I looked back at the picture, it wasn’t ugly. I stopped writing and showed the picture to the meta-class and explained the post I was planning on writing (this post). 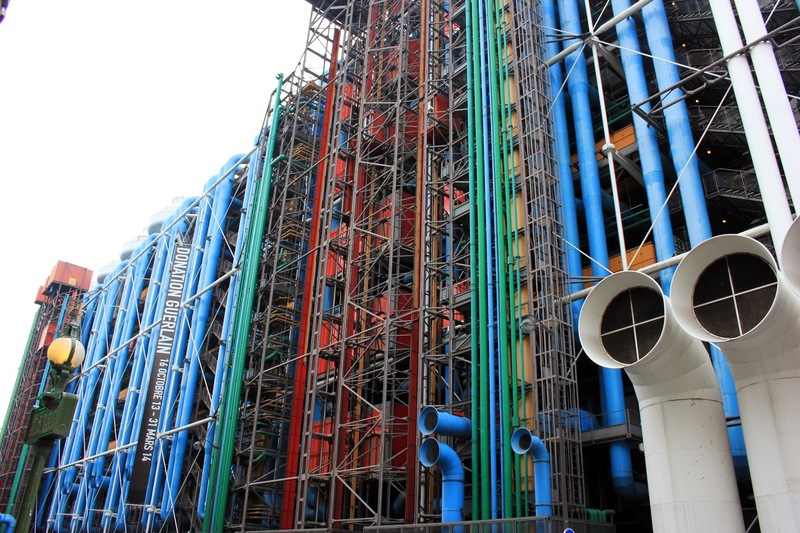 My fellow meta-students, Ian Latta and Kt Fox, challenged my assessment of the Pompidou Center. Ian was enthusiastic about the museum’s raw nakedness. And why does a building have to be beautiful anyway? I realized I would have to change my plans for this post. When speaking about “Octet,” I made my complaints about the pop quizzes that could have been, which I felt sure were more emotionally satisfying than the dry and lengthy self-analysis in the last half of “Octet.” Every example I tried to pull out to show the aridness of Wallace’s formal experimentation, the dry intellectualism, however, turned out to be quite interesting when read aloud. For example, “You know for sure, though that the narrative pieces really are just ‘pieces’ and nothing more, i.e. that is the way they fit together into the larger cycle that comprises them that is crucial to whatever ‘something’ you want to ‘interrogate’ a human ‘sense of,’ and so on” (Wallace115). Wallace does want the reader to feel something, but I didn’t think I was feeling it. What I was experiencing as I read the tenth metafictional short story in a row in our reading series was that he was right: metafiction can seem “lame and tired and facile.” He falls into the very trap he is warning himself against, but doesn’t the fact that he acknowledges it, somehow redeem the work? Not necessarily. Do I get the sense of the urgency Wallace wants to communicate? I know, in spite of the sour look on my face, that he’s tying hard to do something. I just want him to bring the quizzes back. Does a story have to affect a reader emotionally? Does my irritation count if that is an emotion Wallace admits he may be producing? What is “Octet” supposed to palpate? “Octet” massages the way an author asks the reader a question, the way a writer revises that question, the way a reader reacts to the revised question. Most importantly, for me, “Octet” addresses the way a reader revises his answer to Wallace’s question. Pompidou is beautiful. “Octet” interrogates what Wallace wanted to interrogate. The danger of meta has not been avoided. Instead, the liability has become an asset. But just barely. Alter, Robert. Partial Magic: The Novel as a Self-Conscious Genre. Berkeley: University of California Press, 1979. Barth, John. “Lost in the Funhouse.” The Contemporary American Short Story. Ed. B. Minh Nguyen and Porter Shreve. New York: Pearson Longman, 2004. Coover, Robert. “Seven Exemplary Fictions.” Pricksongs and Descants. New York: Grove Press, 1969. Gass, William H. “In the Heart of the Heart of the Country.” American Short Stories Since 1945. Ed. John G. Parks. New York: Oxford University Press, 2002. Wallace, David Foster. “Octet.” Brief Interviews with Hideous Men. New York: Back Bay Books, 2000. By your reading, the first few quizzes Wallace includes are in fact emotionally charged, though exactly how we are meant to respond seems ambiguous. Quiz 9, on the other hand, seems more intellectually driven; it is no longer emotionally engaging or beautiful the way the first quizzes were. For you, this means that Wallace has fallen into the same trap he was writing about. This shift struck me, however, as more useful to the whole piece than that. A writer so deliberate as Wallace would not have simply slipped up and gone metafictional; if he included Quiz 9 in the piece, it’s because he thought it needed to be part of it. Perhaps the metafictional self-reference is designed to get the reader to pay closer attention to the text, to pay closer attention to how the different quizzes connect. To think about what the different questions have in common, to try and work out what exactly it is Wallace is trying to ” ‘interrogate’ a human ‘sense of. '” Wallace is known for wanting his readers to ‘do work’ while they read; perhaps the suggestion is that we, as readers, need to do some real intellectual work to uncover what exactly the quizzes are after. After looking over the quizzes, it doesn’t seem like a stretch to suggest that they all involve a sense of selflessness, that they all involve characters compromising themselves in some way for the benefit of others. Perhaps, going with this line of thought, we ought to read Quiz 9 in this light: that Wallace feels the need to compromise himself by including a metafictional piece in order to successfully interrogate the reader, in order for the Octet to actually work. Thanks Charlie for this thoughtful response. When I read “Octet,” I grew dissatisfied, but as I thought more about the piece, discussed it with the others in my book club, and wrote about it, my attitude began to change. At the end of my post above, I stated that “Octet” was successful in that it addressed the types of problems writers present their readers and the kinds of responses readers may give. It’s true that I missed the emotional force of the first few quizzes in the later part of “Octet,” but I asked myself why fiction must have an emotional impact, as I wondered why a building must be beautiful. These expectation are artificial and external, conventions of fiction and architecture, rather than inherent requirements. With that in mind, I feel I understood better what Wallace was trying to accomplish when questioning the limits and uses of metafiction. The fact that Wallace addresses the danger directly does not mean that he avoids an arid experiment in form — even he admits that “Octet” falls victim to the danger — but I do feel he was able to get beyond the potential shortcomings of metafiction, not by going around them, but by plowing directly throw them, in order to get at something on the other side. Even though “Octet” may still frustrate me, I deeply admire it. It is metafiction about metafiction, showing at once what can go wrong with metafiction and what metafiction can accomplish. I haven’t read much Wallace up to this point, but reading “Octet” I felt that I had come across a writer I could respect, a writer that could scratch an itch I didn’t even know I had. Thanks again for your lengthy comment, which expands, qualifies, and questions my post, therefore making this post richer and more complex. In a very real sense, we both are still involved in answering quiz number 9 as we attempt to grapple with that human sense of something Wallace was trying to interrogate. If the quiz is still being answered, then it must have been a useful question. I generally skip Octet. Not because it is “dangerous,” because it’s tedious. And the critique of metafiction you (belatedly) identify in Octet is better handled by The Depressed Person, which is really about the same thing: the terror of recursive processes.